Can you even believe another year is over? Sometimes the days seem so long, but then, the whole year is over and you're wondering where all that time went. I always like to take today to pause and reflect back on the year. It's a good way to remember joy in the ordinary things we did. It snowed so much. We spent a lot of time inside, playing with snow, baking, and watching movies. 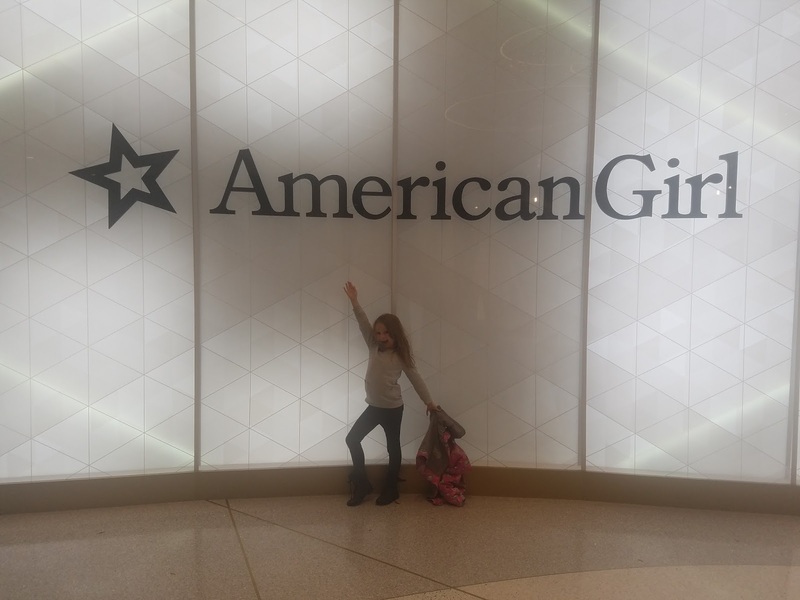 We visited the American Girl store with Mimi and Aunties and even drove to New Hampshire to see Elsa's Ice Castle. Another cold month with more snow! But we spent time at the Cape Cod Children's Museum, spent my 31st birthday night down the Cape at a hotel and found the best donuts on Cape. We celebrated Dr Suess Day at school, spent time volunteering at Gifts to Give, and David had surgery to correct his deviated septum. 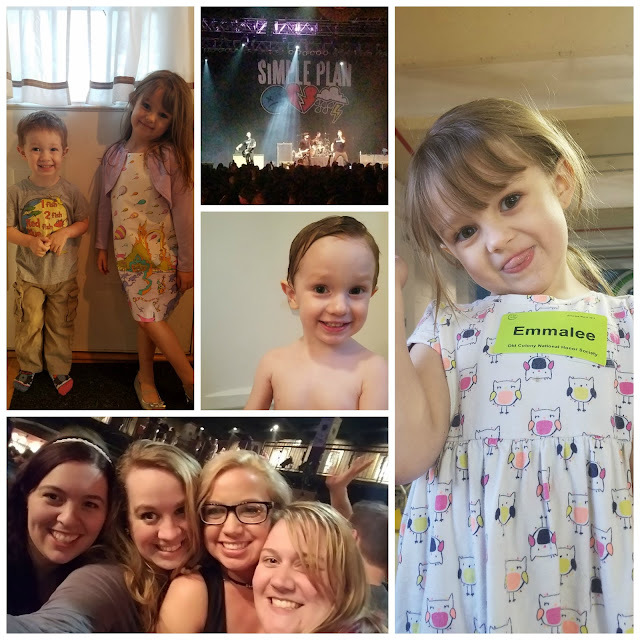 I spent the night with some favorites seeing Simple Plan! And it started to get busy again! It was finally warm enough to be outside so we went to Buttonwood Park Zoo and the Isabella Stuart Gardener Museum. Emma got bit by the comp bug after cheering on her friends. We went to P-Town for our annual trip and discovered the daffodil fields in Dartmouth. We celebrated Easter and Dave and I even got a date night at Foxwoods, complete with a trip to the Sugar Factory! May is always a busy month with 2 birthdays! 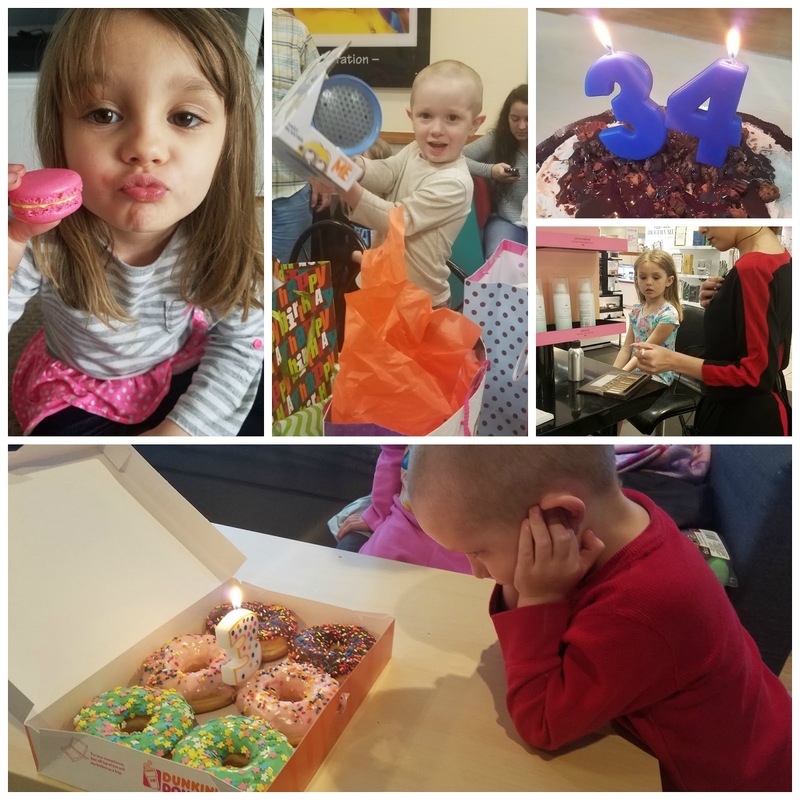 Tyler turned 3 with a Chuck E Cheese birthday party and David turned 34! Emma discovered Sephora and we made our first macarons! 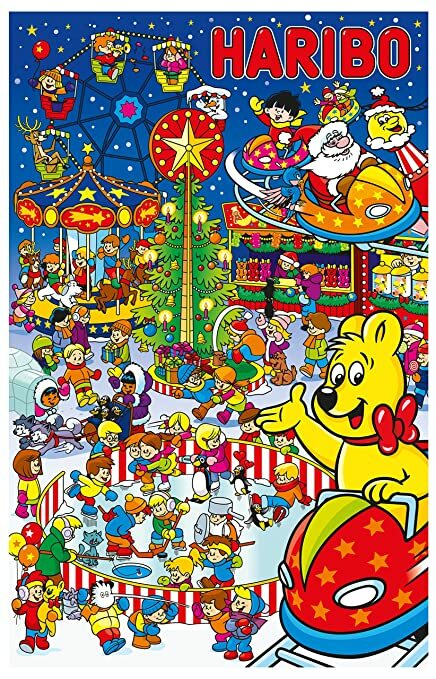 The busiest month of the year! 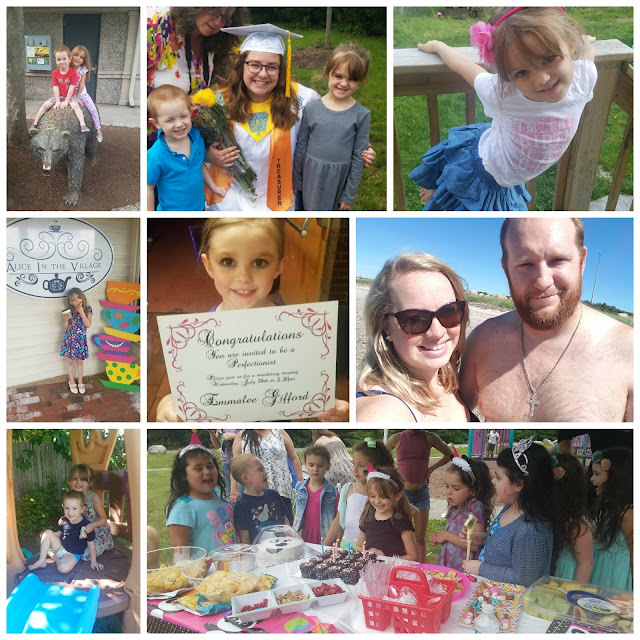 We got to see my baby sister graduate from high school, Emmalee turned 6, and she was invited to join her competitive dance team! 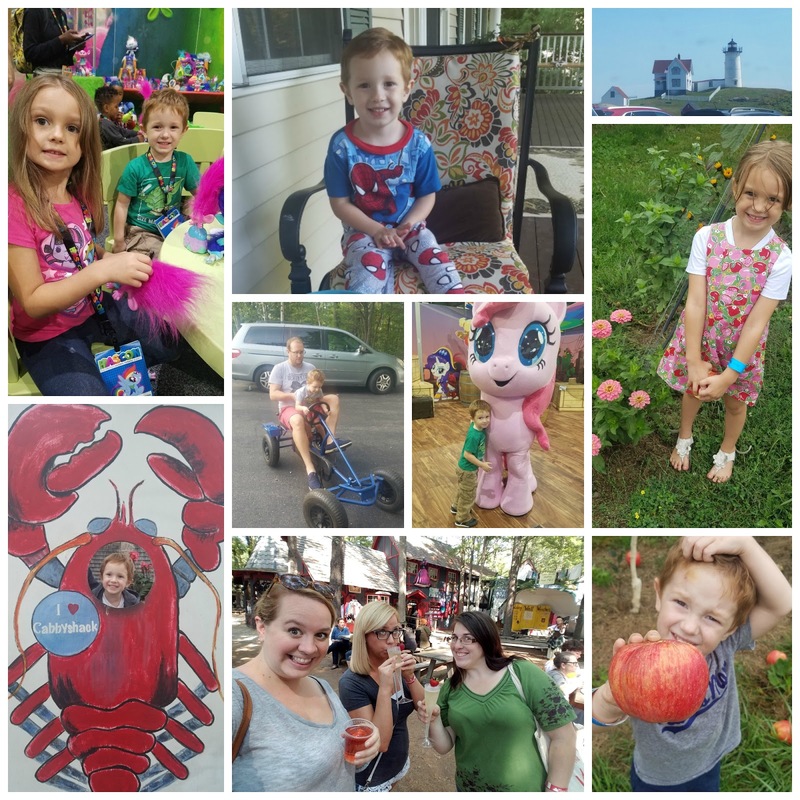 We spent a weekend in Newport and a month of playgrounds, ice cream, and beach trips was wonderful, but Emma's favorite trip was to Alice in the Village tea shop! Another super busy month- we really love summer! 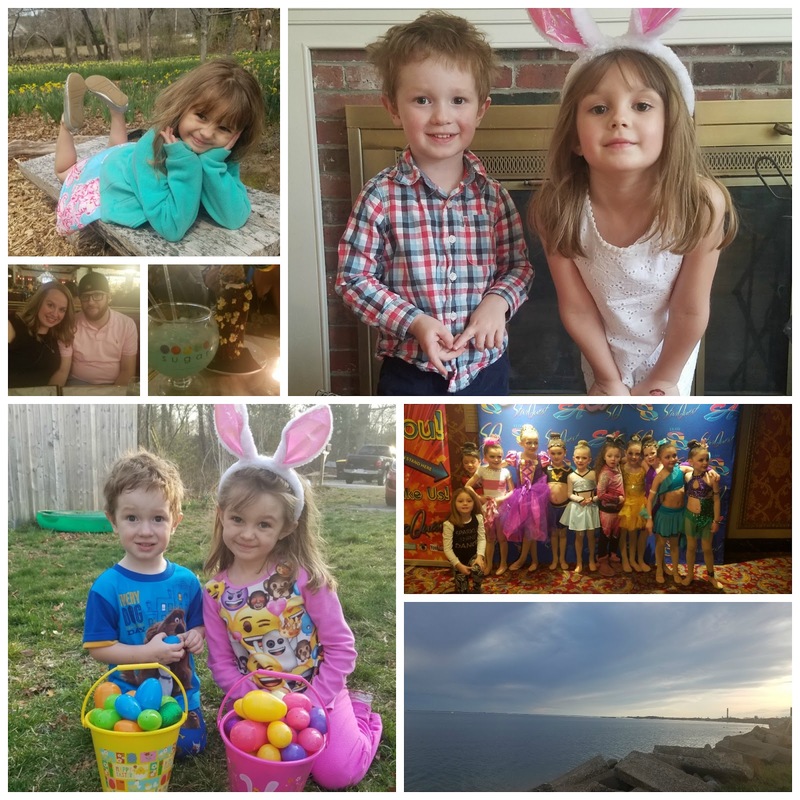 We spent more time at the local zoo, plus we visited the Museum of Science and another zoo! 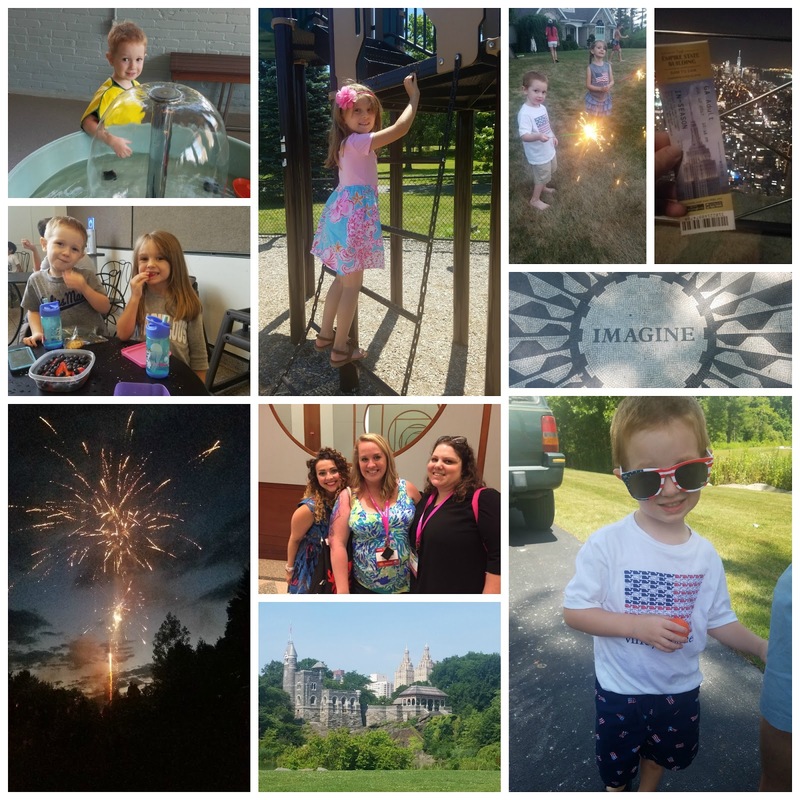 We celebrated the 4th with fireworks, family, and sparklers. I attended Blogger Bash in NYC and found the ever elusive to me Strawberry Fields and Central Park Castle! I went to the top of the Empire State Building and found the super trendy cookie dough store! 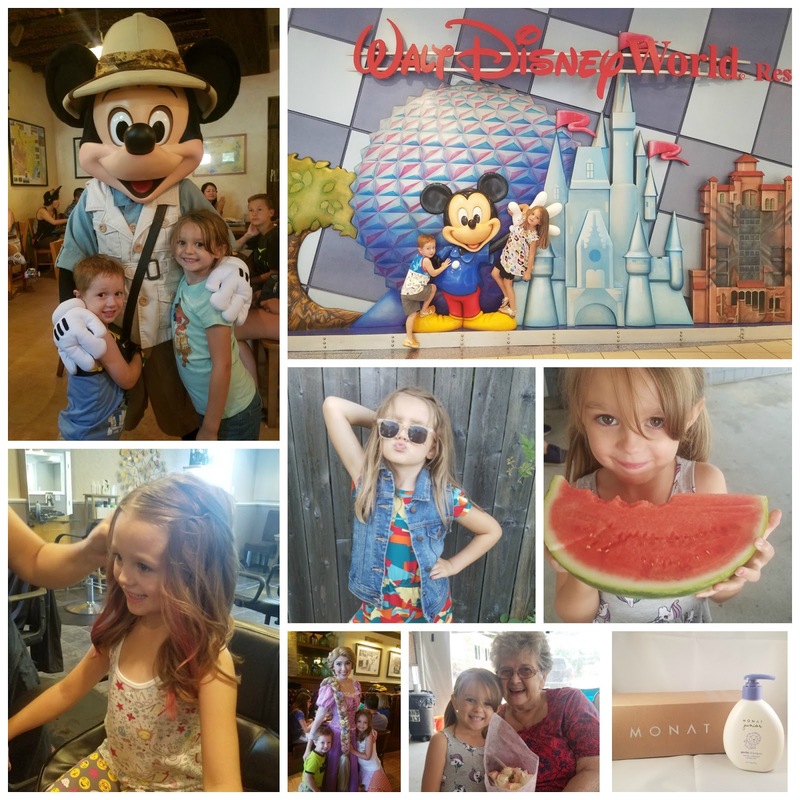 Our last of summer consisted of the annual lobster boil, Emmalee getting pink hair, me starting my MONAT business, and a trip to Disney! Our trip was quick but so much fun! 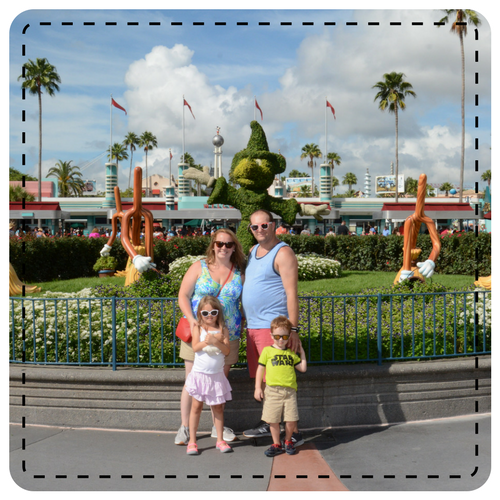 We hit all 4 parks in 2 days, complete with Early Morning Magic hours at Magic Kingdom and the Star Wars Dessert Party! We rode every ride we wanted to and still had time to sit and enjoy meals with characters! I found out that I had an underactive thyroid and was finally able to start medicating properly! 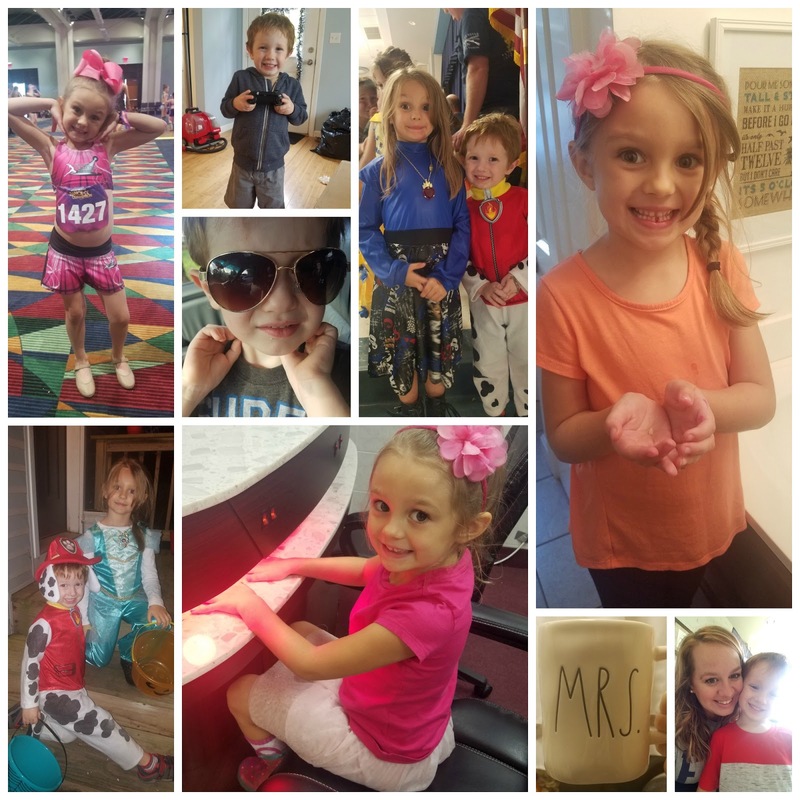 Emmalee started 1st grade and Tyler moved from daycare to preschool! 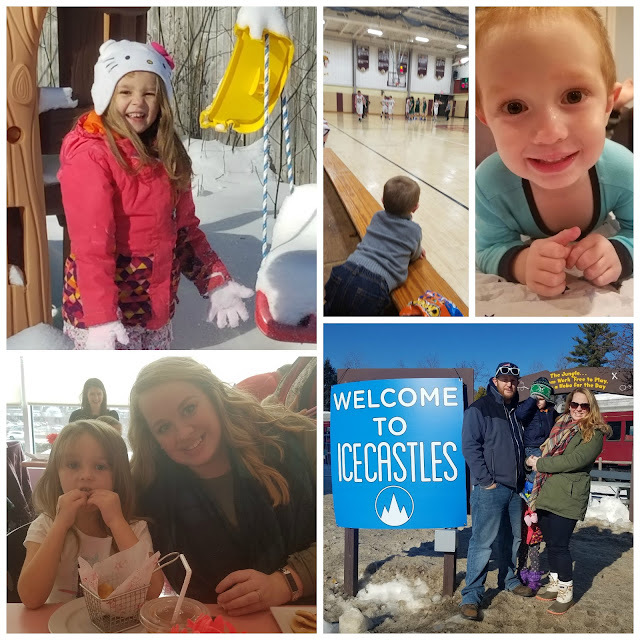 We spent a weekend in New Hampshire with cousins and visited my favorite spots in Maine from when I was a kid. 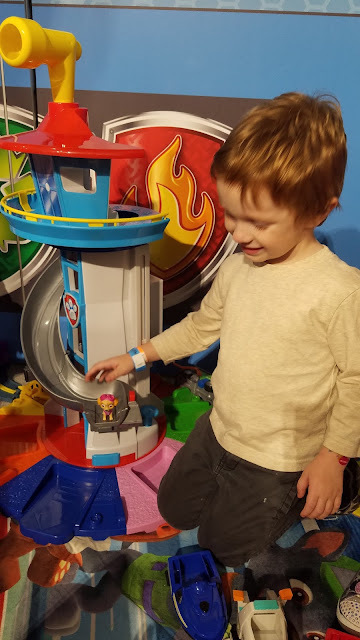 We were invited to HasCon to check out the cool toys for Christmas. Went apple picking and spent even more time with my siblings and mom. I even had a girls day at King Richard's Faire! 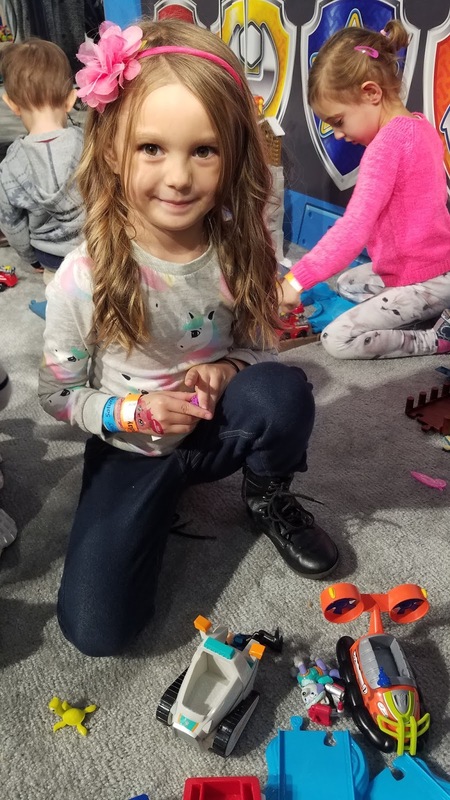 Emmalee attended her first dance convention and learned so much, while Tyler discovered video games and became obsessed with Disney Infinity. 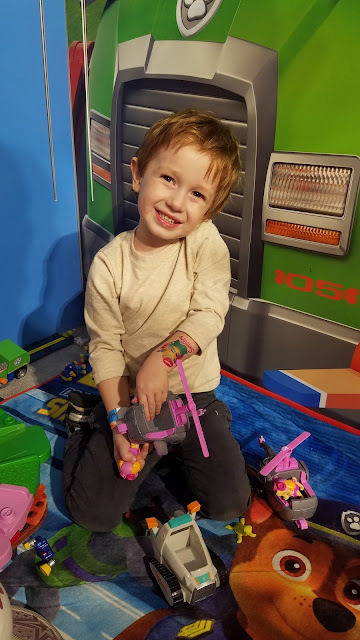 We made a big deal of the My Little Pony movie coming out and had a girlfriend day, complete with make up and manicures. Emmalee lost her first tooth and I fell in love with Rae Dunn. Of course, Halloween, but we were so busy the kids went trick or treating 5 times! 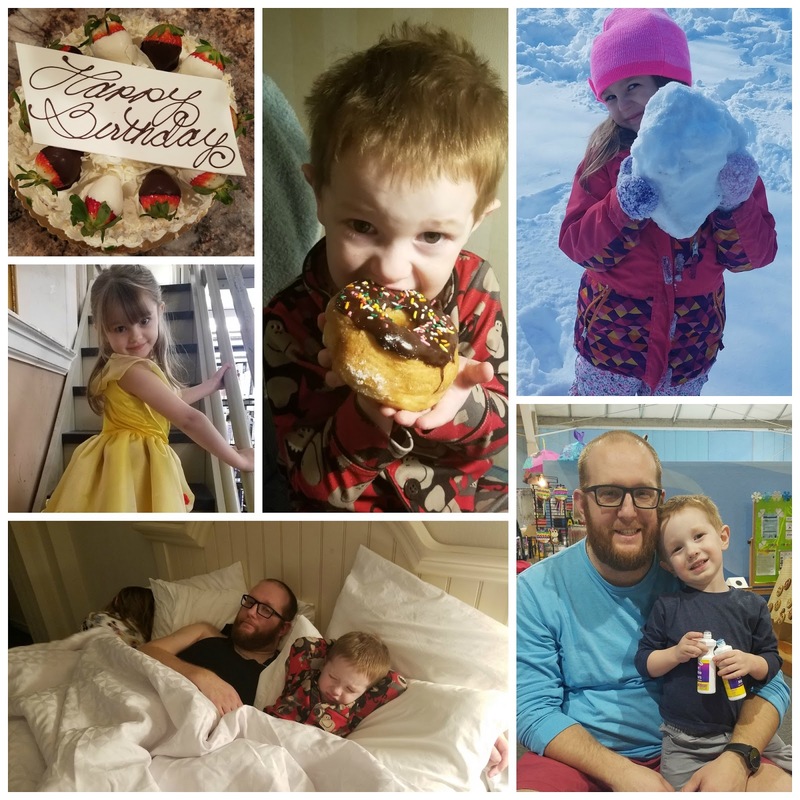 Another month that ended up being much busier than expected! We started the month celebrating my grandmother's 80th birthday with a surprise party! The we went NYC for PlayFair and Emma was in a Shopkins fashion show! We stayed local to meet Anna and Elsa at the mall and went to the wrong night of a fundraiser at Chuck E Cheese. 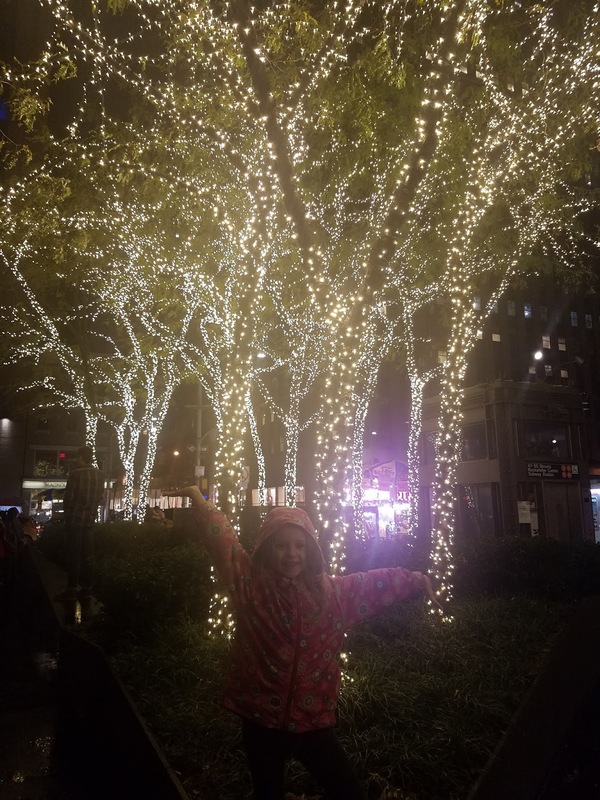 We went to Heritage Gardens to see the lights and met Mrs. Claus. 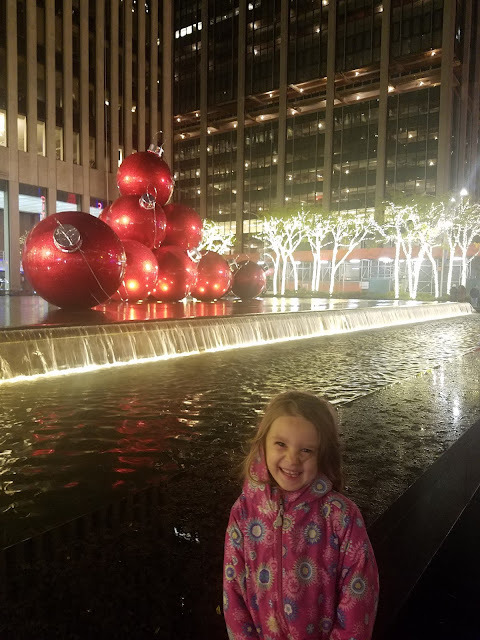 Emmalee and I went back to NYC to see the Rockettes and visited the American Girl Store, after our car blew a tire on the side of 195. We took family pictures and celebrated the engagement of my brother and future sister-in-law. The kids met Santa when they went out for a night out without me! And just like that, the year is over! 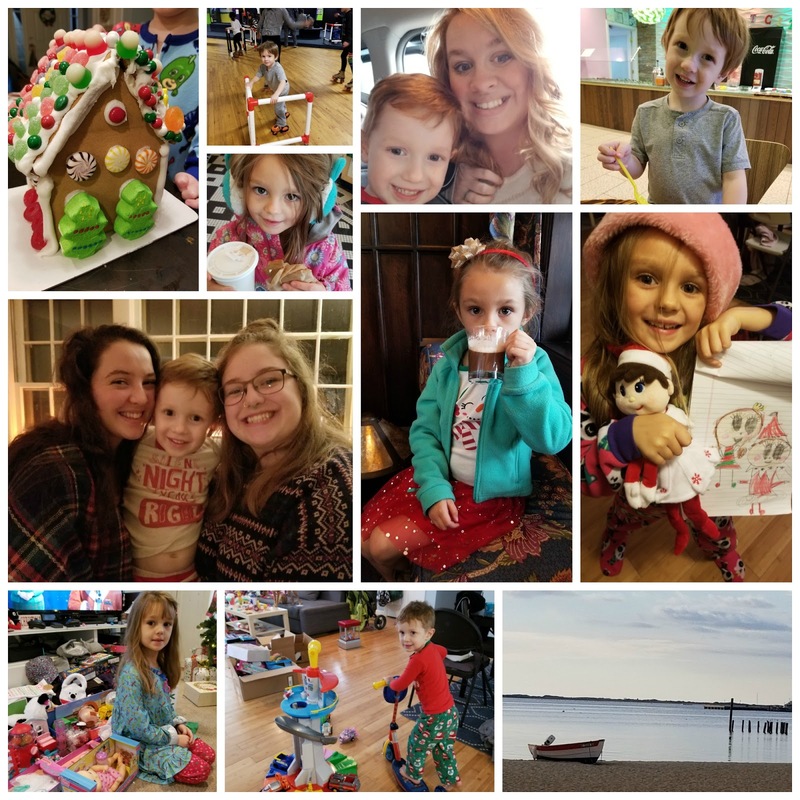 We had time to squeeze in another trip to P-Town and some gingerbread decorating. Emma danced at nursing homes with her dance team and we had an elf at our house for the first time! We spent Christmas Eve at my grandmother's and then relaxed all day in our pajamas at home on Christmas. 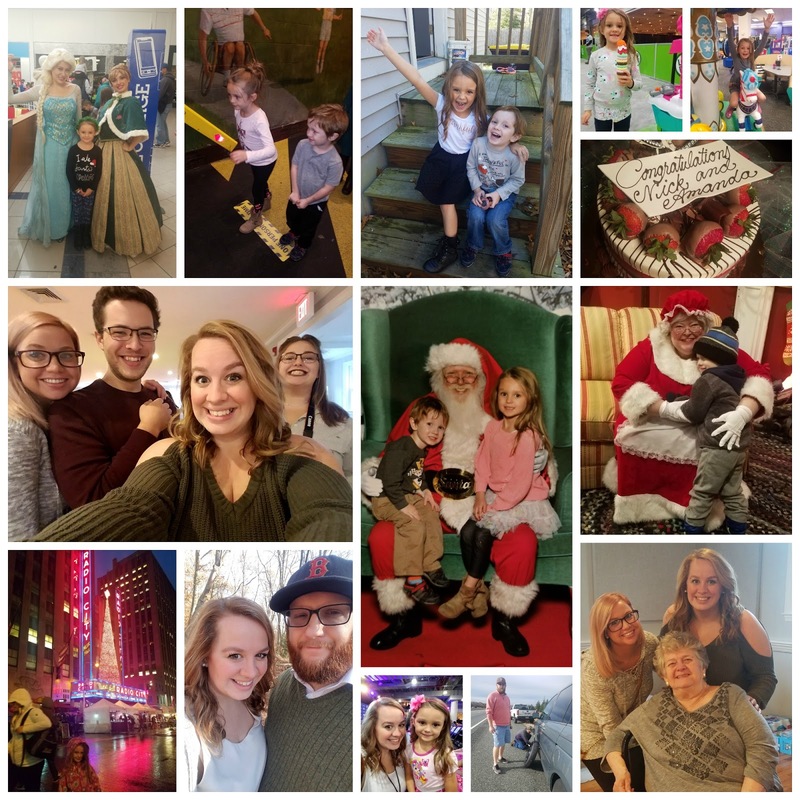 For the first year (probably ever), we had no plans or tickets for vacation week and just enjoyed being home with each other! I love looking at pictures of how much the kids have grown over the year, but it's a good reminder that I've grown so much too. So many people will complain about 2017 and the dumpster fire that it was, but I choose to find the joy in each month, in each moment. Here's to new adventures and more joy in 2018! Anyone else love the satisfaction of cleaning up after Christmas? I love Christmas, I really do... but there's something so satisfying about everything being put back in order. As a teacher, I capitalize on putting it away early, which gives me more time to enjoy my clean, well as clean as it will ever be with a 3 and 6 year old, living room before it's back to school time. I think they'd look so amazing in the house! Anyone else find they want to rearrange everything and order all new furniture after you take down the holiday decorations? It's not always easy to have an on hand gift or to have something for your 24 cousins when you head to your grandma's for the holiday, and since I'm not made of gold, I thought these would be an adorable and easy way to gift everyone! Mini soda cans - or Pineapple juice cans! 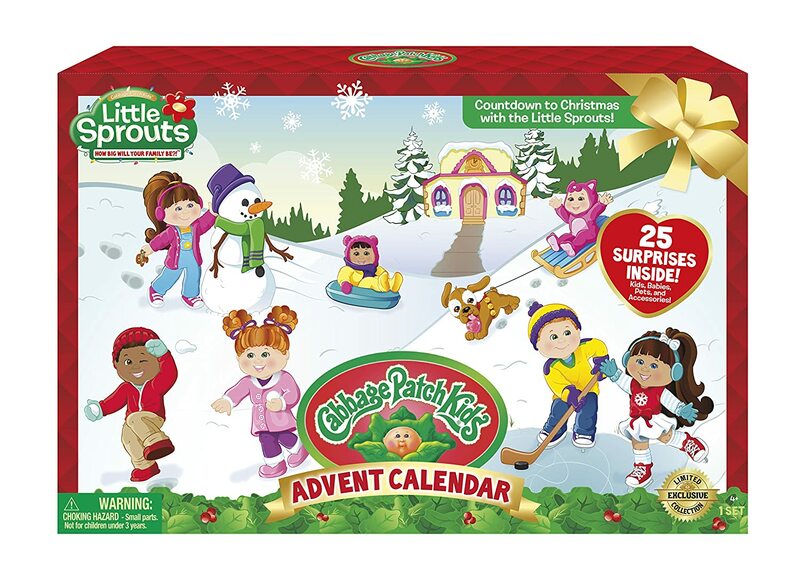 (Buy them from Amazon #affiliatelink or at your local grocer). I had to think of a few favorite combinations but I'm always known to go for a Malibu and pineapple juice or a vodka and sprite so those were first on my list! David is a Bacardi and Diet soda fan, and who doesn't love a Jack and Coke? A few dollars at the packie and I was set to assemble! After all is said and done, it cost me roughly $5 each, and honestly, I'd rather get this than a $5 gift card to the convenience store down the street! 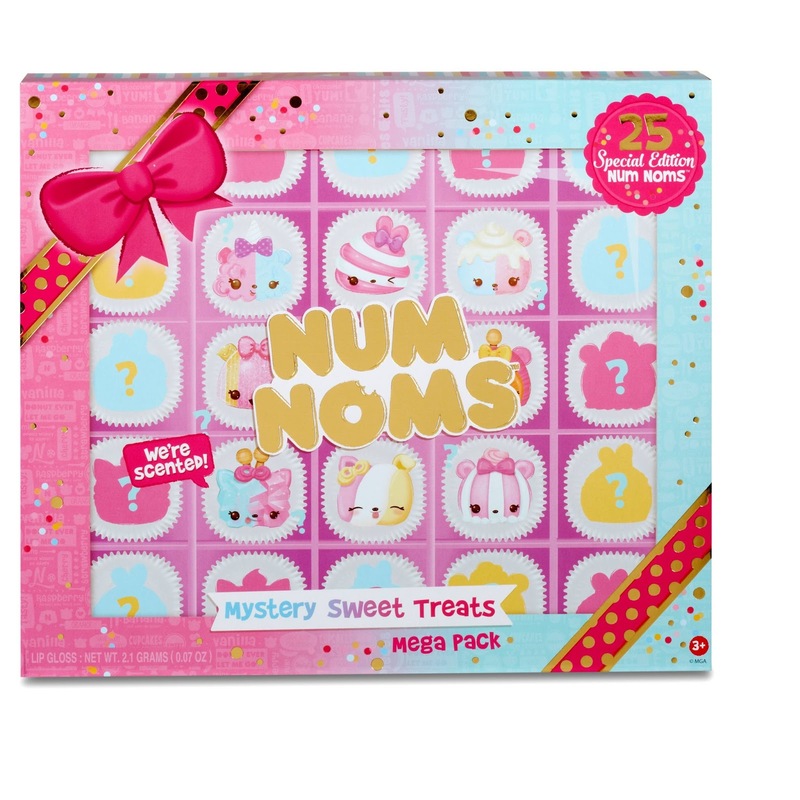 What other combinations would you gift? Admit you, you thought about this song too, and if not, you will now. 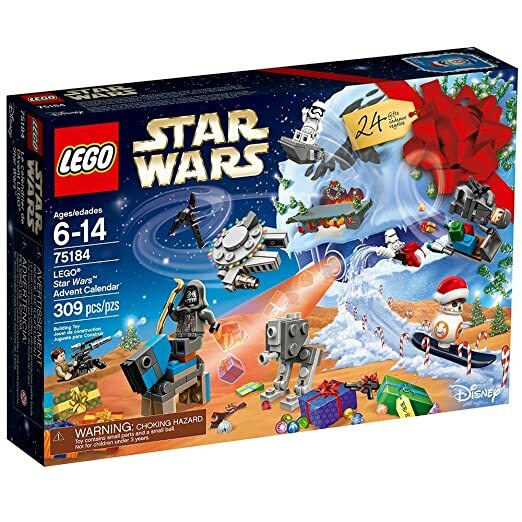 I honestly don't have many wishes this year, and most of what I want actually counts as stuff for the house instead of just for me, and honestly it's a true wishlist. I'd love a new living rug, one like this or this, since the kids have destroyed the one we have over the past 3 years. I'd love if the fence around my house actually went all the way around my house. I'd love electric plugs in the basement. I can't wait to tile our backsplash. I fell in love with the blue color of this glass tile, but so far it's a no go- this one might be pretty too. 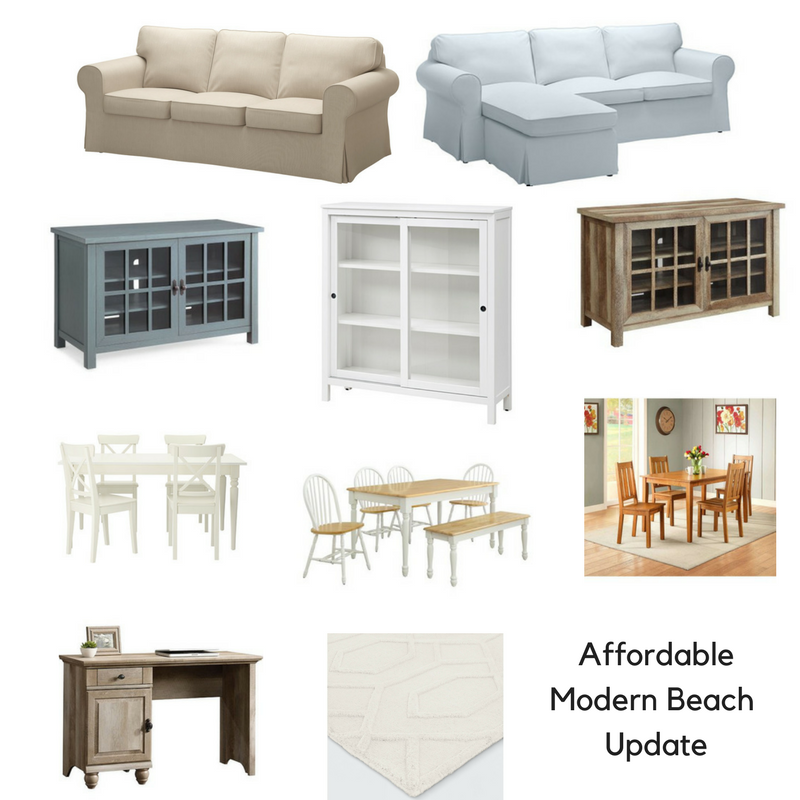 I'd love a new sofa -- I'm particularly obsessed with beige 3 seat sofas but a standard Ikea Ektorp wouldn't be bad either. I'd love a side board/server/hutch for my kitchen, that could go next to our desk. We have a great gallery wall and I'd love to have a piece to anchor and offer storage so I'm not always going down stairs for my fancier dishes, etc. And I'm so hard to shop for clothes for. I'm so picky. However, I took advantage of great sales and just bought basically a new wardrobe-- new pants and tops and shoes! I spent under $150 for all of it so I'm happy to do it myself and get the things I love for super low prices! And did I mention I bought new slippers?! I can't wait for those to come in the mail! A Kendra Scott Elisa necklace. Honestly, the one I want doesn't exist but thankfully, Kendra Scott allows you to use the color bar and create your own! I'd do a Rhodium plated with either the Dichroic glass or the Emerald Kyocera Opal. Both are so gorgeous! Taylor Swift tickets. Don't judge me. I am loving her new album. I saw her over 10 years ago and then stayed away but after Reputation, I'd love a seat as a Christmas gift! A Heat Press or the Cricut Easy Press. I've been having so much fun using my Cricut machine to make shirts for Emmalee and Tyler, but it's difficult using the iron to apply as much pressure as I need. The Easy Press is new and people seem to love it, but it's only 9" by 9". However, it's super portable and since I'm often carrying things up from my basement to the kitchen table to work-- it would be so convenient! There are so many heat presses on Amazon for around the same price (or less! ), like this one, this one, and this one that have a bigger area, but I'd honestly be happy with either! An Instant Pot. It seems like everyone has one lately and honestly, I held back since I love my crockpot but so many mornings I forget to set it up and then I'm scrambling for dinner. With an Instant Pot, I could throw in frozen chicken and still have a delicious meal shortly after! A Kitchenaide Stand Mixer, either a classic or a mini, but honestly, the classic seems to be less than the mini everywhere I look! I'd love a silver or matte grey one to go with my kitchen, but I'm not choosy! My husband bought me a stand mixer a few years back but, unfortunately, the beaters didn't go down far enough in the bowl so if I only had a couple egg whites in it that needed beating, the blade didn't reach! I had to hold the bowl up in the air and that really defeated the purpose of having a stand mixer! A hand lettering kit. I love hand lettering and would love to actually get better at it! 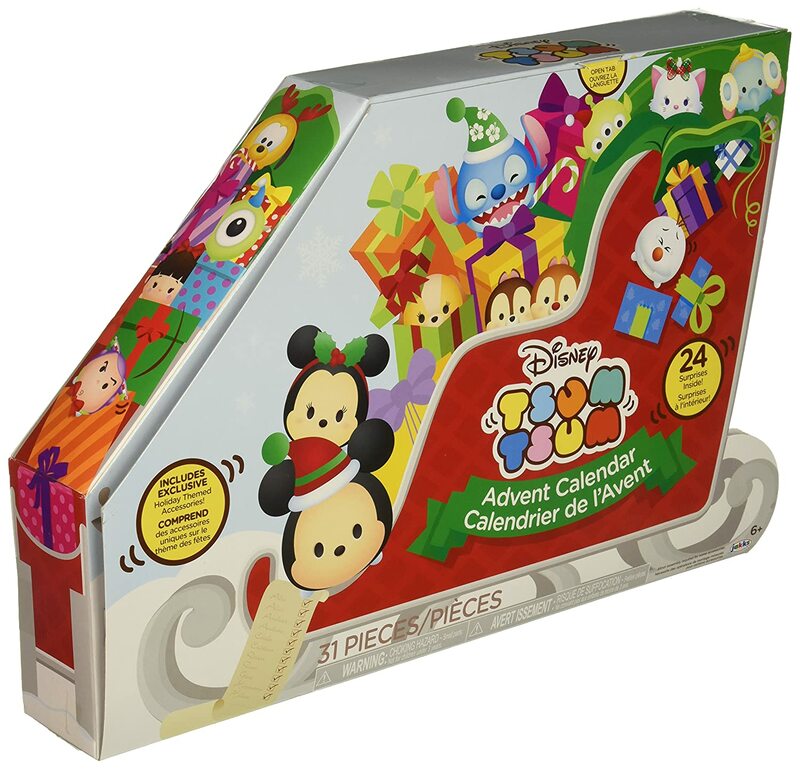 Kits like this one and this one (and obviously some markers to go with) would be awesome to find under the tree! However, there are a few things that won't fit under the tree that I'd love. 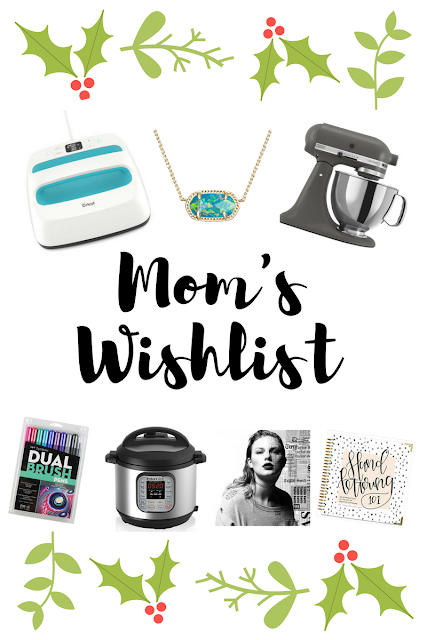 I'm a big fan of experiences as gifts and I'd be so excited to find out I was going to have my palm read or would be able to attend a cake decorating class (like at Michael's), or a cooking class (either fun with my friends or romantic with the husband! ), or a photography or hand lettering class. There are so many on Eventbrite, I'm sure I could find something local! Honestly, a night of free babysitting so Dave and I could grab a drink would be more than enough! 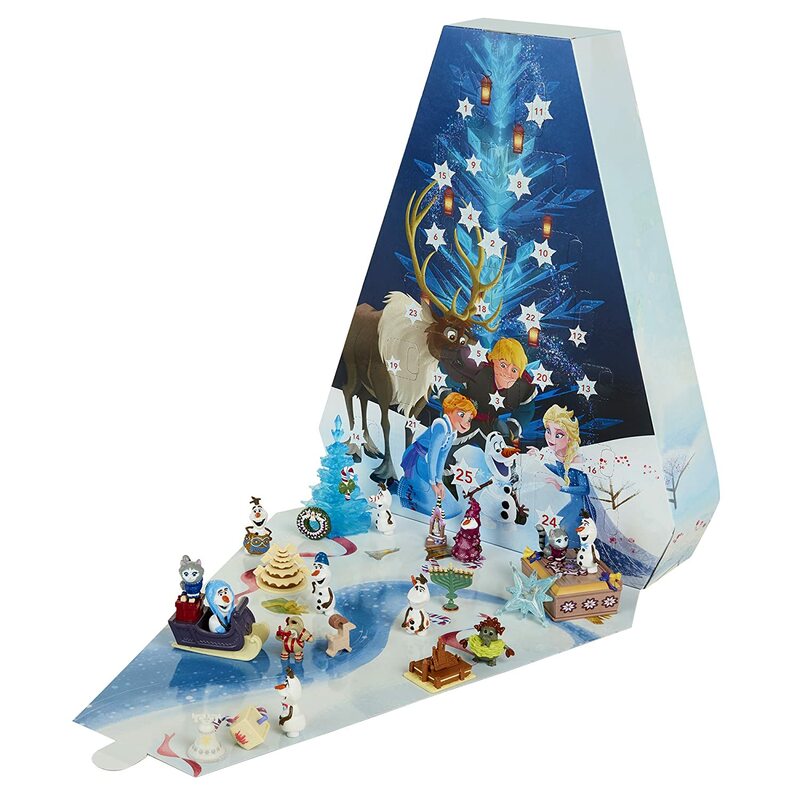 I know I'm getting old since I have such a boring Christmas wishlist but I kind of love it! What are you asking for? I am super excited because I'm sharing one of my favorite movies: How the Grinch Stole Christmas! 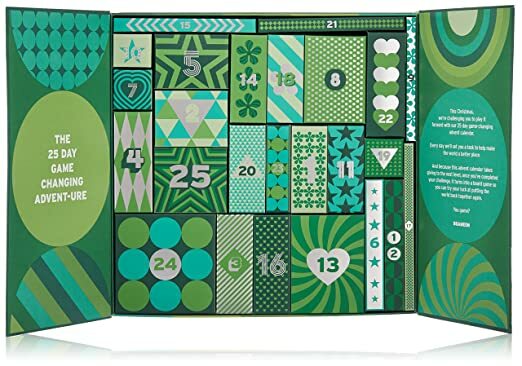 So much of the holidays is focused on food, and oh man, do I love it, but since I've been trying to be better since I started medicating my thyroid, I decided to focus on something a bit better for me than sugar laden treats. If I could choose any meal to eat with my family, it would be breakfast. Dinners are so hectic, often running in from an activity and eating it quickly so we can take tubbies, pack lunches, and get into pajamas before the next day starts, but breakfast is pajamas and the couch, full of snuggles and laziness. 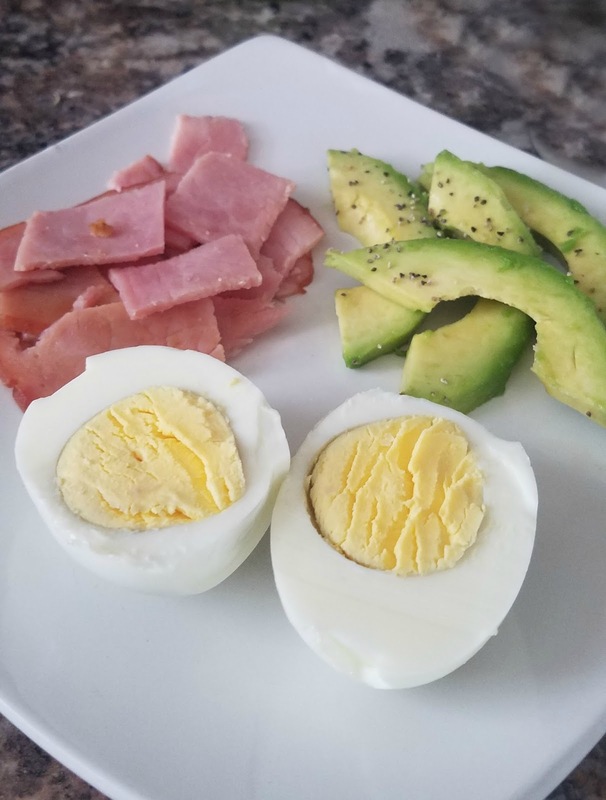 There are so many overly sweet breakfasts, and trust me, I love them, but when I think of The Grinch, I think of Dr. Suess which makes me think of Green Eggs and Ham, which is my favorite. 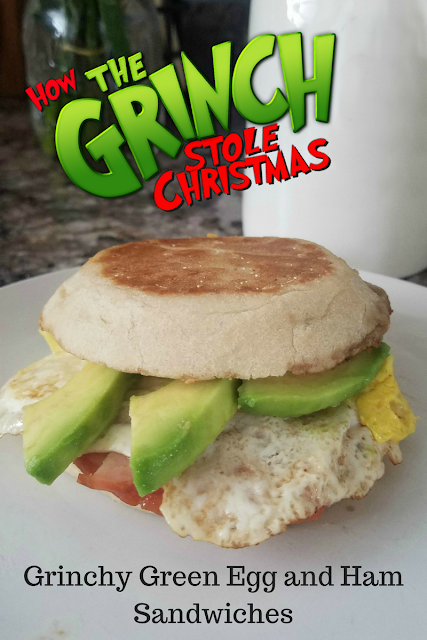 By combining my favorite Christmas movie, with my favorite Dr Seuss book, with a healthy breakfast, I came up with my amazingly delicious Grinchy Green Egg and Ham Sandwiches! With such a simple meal, I can spend extra time with my kids on the couch. The whole thing can be made in 2 pans or less which means clean up is a breeze also! Plus, if I eat healthier over the course of the month, it makes eating a couple homemade cinnamon rolls on Christmas morning a little bit more enjoyable. 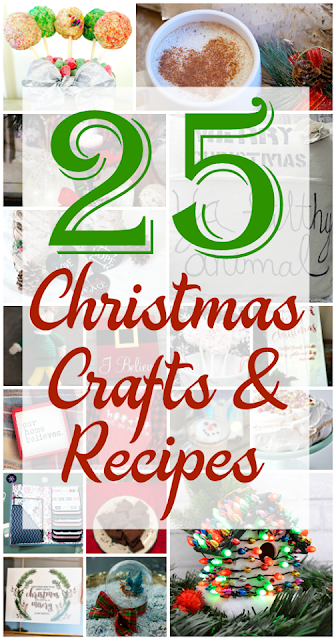 Be sure to check out all the other amazing projects and let me know your favorites! 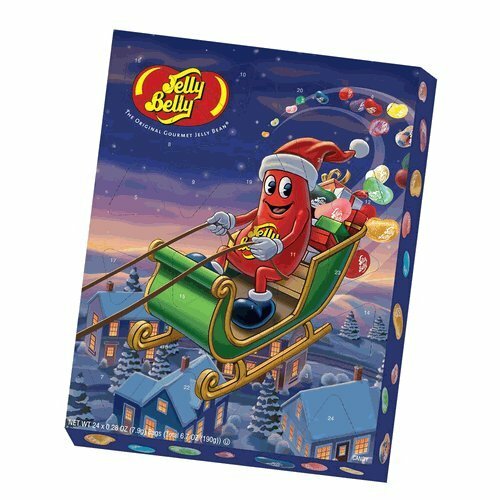 It's almost December which means it's almost time for Advent Calendars! 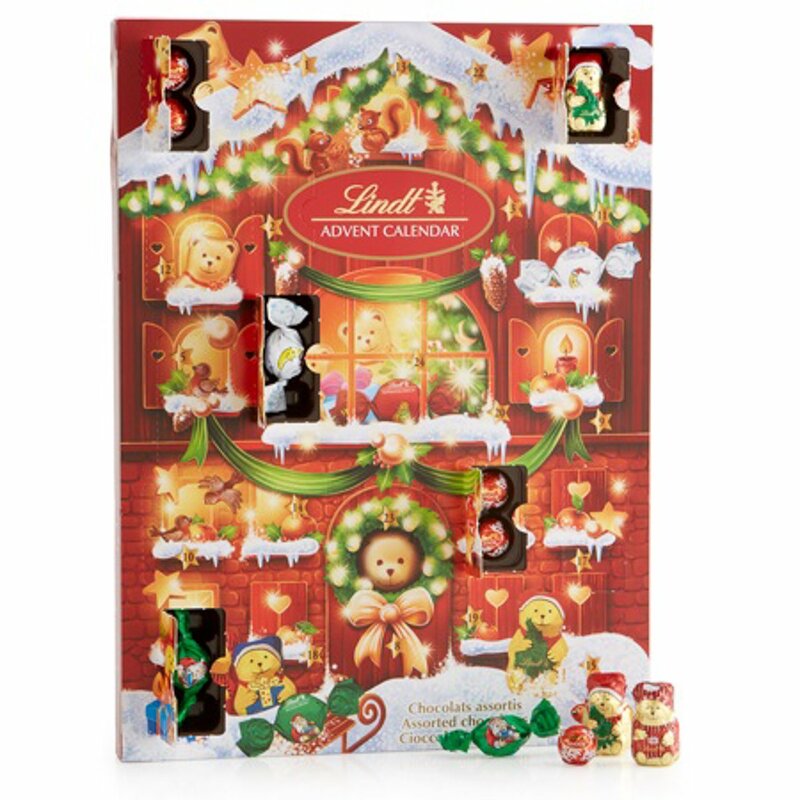 Growing up my mom always bought us the chocolate Advent calendars and I seriously looked forward to it every year! 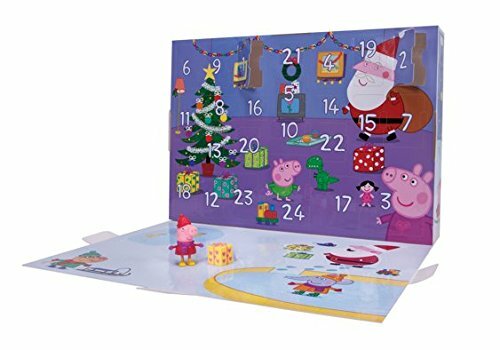 Since having my own kids, we've continued the tradition of countdown calendars and I'm amazed by what is offered now a days! 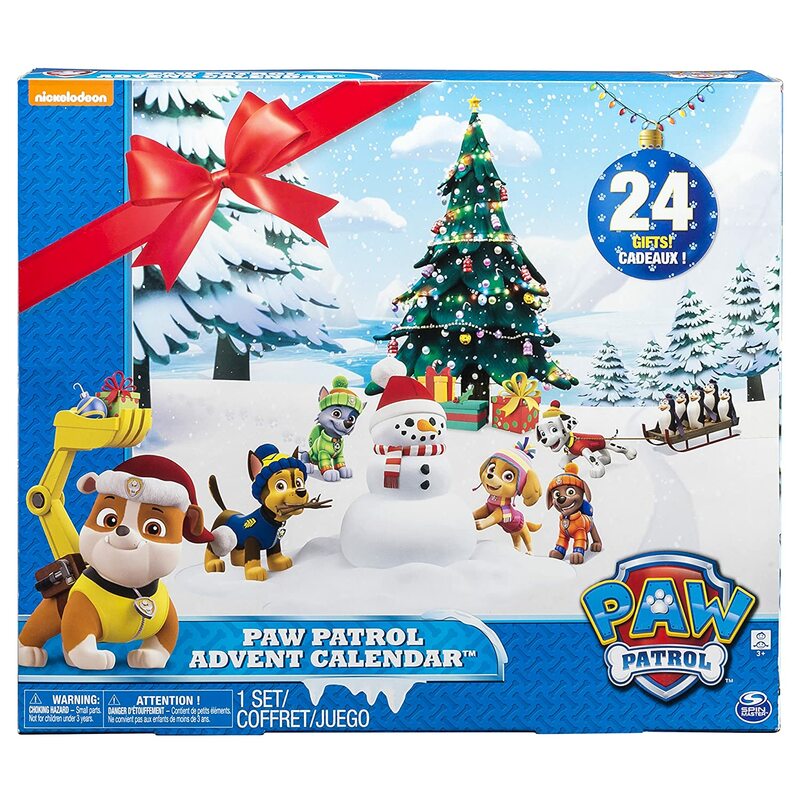 check out these great advent calendars for both kids and parents! 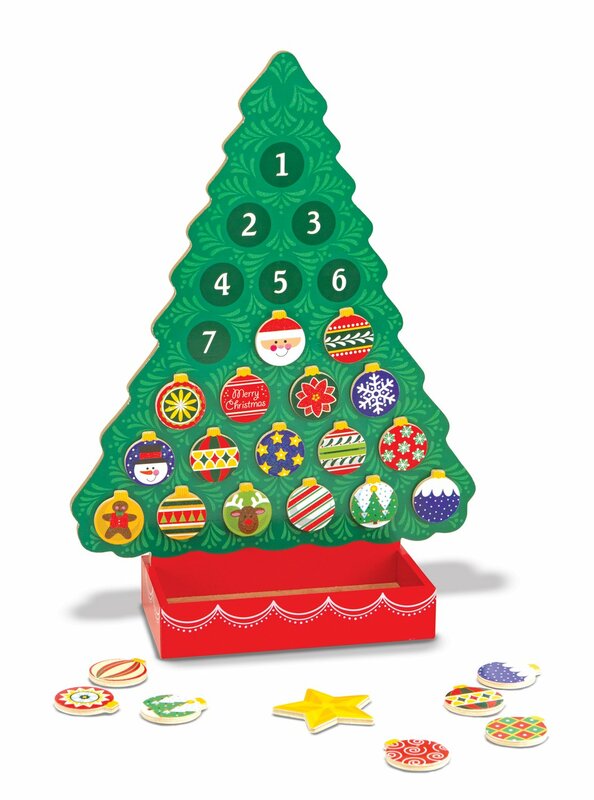 (Not really an advent calendar but with 25 pieces, it would work! I'd be excited to get a couple of them! 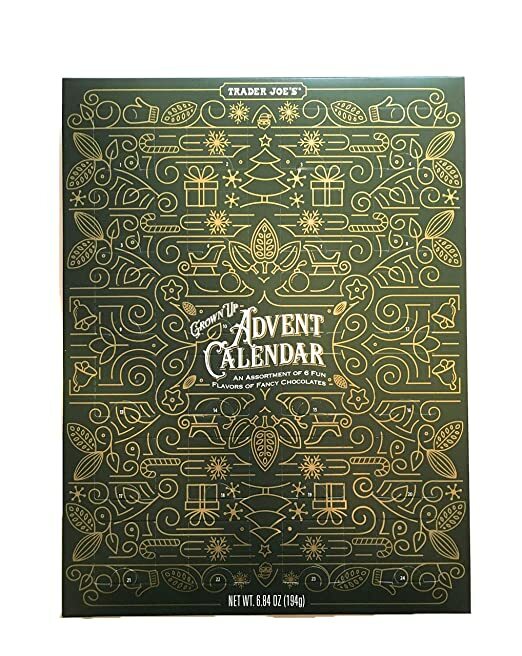 Do you have an advent calendar or will you picking up one of these? It's been a hot minute since I updated the 40 in 4 list, and honestly, it's not moving very quickly. This might become a 40 by 40 if I don't start accomplishing things! But we did head back to Disney, so I can cross that one off. You can see posts about our trip here, here, and here. Additionally, it's not technically a Broadway show but it was right in New York and I have dreamed about it, so I'm counting it. I brought Emma to see the Rockettes (see the post here!). I'm counting it, get over it. Also, this year, we did a planter box of tomatoes! Sadly, I only got to eat like 4 all summer long because my kids kept going outside to steal them, but it was really great to have fresh tomatoes all summer! Next year we're going to try tomatoes, snap peas, and green beans! I'm hoping that we can accomplish a few more things as Holiday and Birthday gifts! What's on your "Must Do list" lately? 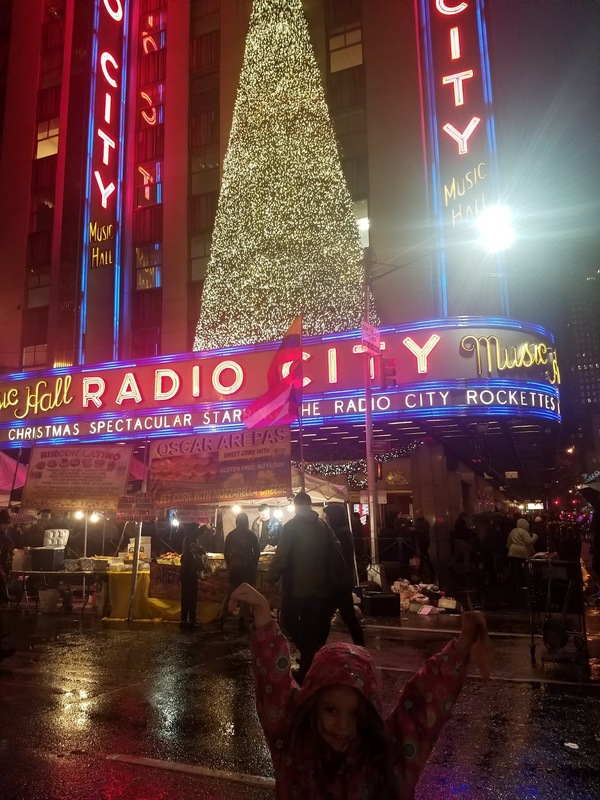 I decided pretty last minute that I wanted to bring Emmalee to see the Rockettes. I've always wanted to see them, literally have dreamed for years but it just never happened. When we went to PlayFair 2 weeks ago, Emmalee saw the posters for the Rockettes and was smitten. A few converstaions at home about how she wants to grow up and be a Rockette, plus an amazing discount from Today Tix meant we booked tickets on Wednessday for the Saturday show. We made a few phone calls to family in Connecticut and we had sleeping arrangements so we were set! We woke up bright and early on Saturday morning, loaded the car and we off. 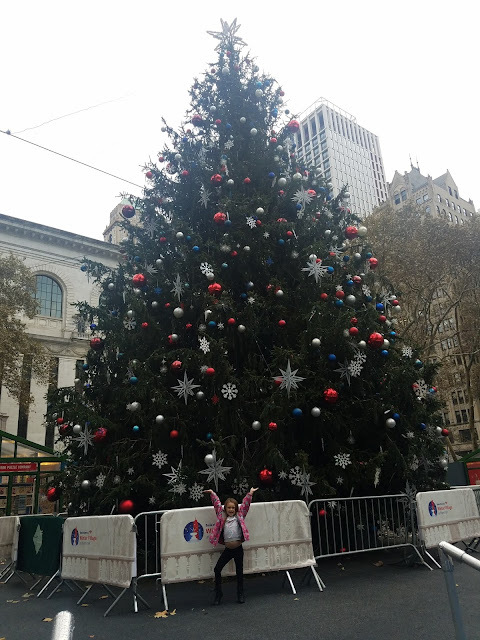 Our plan was to be in CT by 11 am, be one train to NYC by 1 pm, get into NYC by 3, stop at American Girl for lunch, see the Rockettes at 5 pm and then head back to CT for bed, but that was not what happened at all. Around 9:30 am, my front tire blew driving down Rt 195, a busy highway, and we were stranded. Our AAA had expired so we began making phone calls for tow trucks and new tires. I literally didn't know that I had a spare in my car so I was super excited when David informed me that there was one in my car! Unfortunately, the lug nuts were too tight and as we tried to get them off, the tire iron snapped. There was a super Wal-Mart roughly 2.5 miles away, over the fence and through the woods, so David set off for a new tire iron. While David was gone, a kind stranger came up and tried to use his tire iron to get the lug nuts off, but it didn't work. The next kind stranger was a much older man who, after learning David had walked to Wal-Mart, volunteered to go pick him up. After he left to get David, a third man stopped to help us. He said he was dropping his friends off at the airport so knew we had been there for a bit. Unfortunately, he was also unable to get the lug nuts off but told me he had a breaker bar at home and he'd go get it and come back. This whole time, my two poor kids are strapped into their carseats so that, god forbid anything happen, they're still safe since sitting on the side of the road in 30 degree weather wasn't ideal. We turned on the heat and the Charlie Brown Thanksgiving dvd and waited. Amazingly, the man brought back my husband, plus hot cocoa for the kids, and minutes later the third man came back with a breaker bar. In minutes, the three men had removed the flat and replaced it with the spare. We drove over to get new tires and at 11:15 we were in line at the mechanics. The trip to New York was about another hour of driving and a 2 hour train ride so we still had time to make our 5 pm show. Then he told us there was at least a 2 hour wait and then another 30-45 minutes to do the tires, which meant, we would not make the show. We had spoken on the phone about where we were going and he said he'd so what he could to move it faster. I called the ticket agency to see if I could swap our 5 pm show for an 8 pm show and was told no refunds or exchanges, but I could list my tickets and if they sold, we would get a refund but if they didn't (which was more likely since the show was only hours away), they would still be at the office with my name on them. 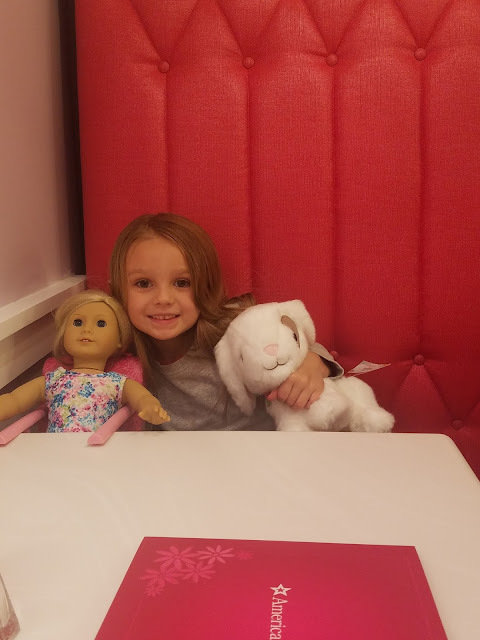 We grabbed lunch in between lots of phone calls from family and friends trying to figure out how to get Emmalee to her Rockettes show. The mechanic was amazing and had us out and on the road by 1:30, a full hour less than he originally quoted. I called the ticketing company back to let them know we were on our way and since I hadn't received anything that they had been listed. The woman on the phone informed me that they had sold less than a minute earlier. Because I'm an emotional person, I started crying. The morning had been so crazy and it finally looked like we would make the show, and it felt like it had been ripped out from under me again. She put me on hold and came back a few minutes later, saying that since the sale hadn't fully processed, they would cancel it and the tickets would be put back in my name. Even more, someone would be waiting outside the theater for me to make it a little easier. Cue more tears. We made it to a 3 pm train and said good bye to the boys, which got us to Grand Central at 4:25, which, by the time we got outside the station, into the pouring rain, it was 4:45. A quick cab ride up to Radio City left us meeting the man with the tickets at 4:57 pm. We paused for a quick picture and got into our seats just as the second number was ending. We missed a bit but were still so thankful we made it! 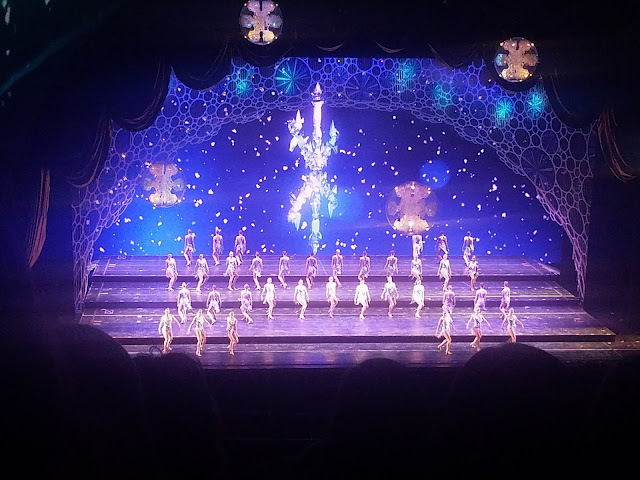 Watching Emma's eyes light up as the Rockettes performed was as magical as I hoped. Her giggles lit up our whole section and in the middle of one number, she jumped over her seat, wrapped me in a hug, and said "Thank you for being the best mommy ever". It was a journey to get to the show, but so worth it. An amazing gift was given to us: a hotel room for the night in the city. Since our day had been cut short, the overnight would give us time to walk around and relax without rushing back to our train. We stopped at American Girl and after some shopping, we checked to see if there was any way to get into the American Girl Cafe since we had missed our earlier plans. Amazingly, the hostess said she would squeeze us in. We stuck to just desserts and cherry sodas and it was a perfect mom and daughter date. 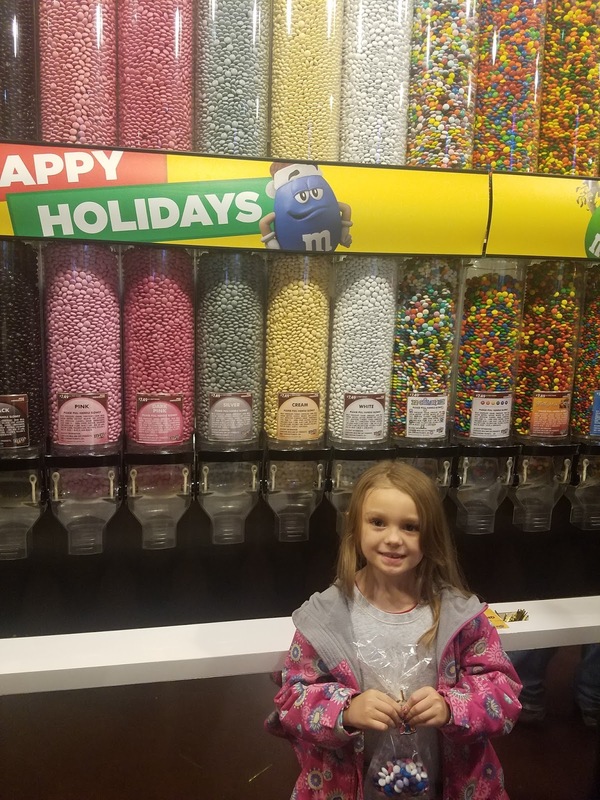 After our snack, we walked through Rockefeller Center and Times Square, with a quick trip to the Disney Store and the M&M store. 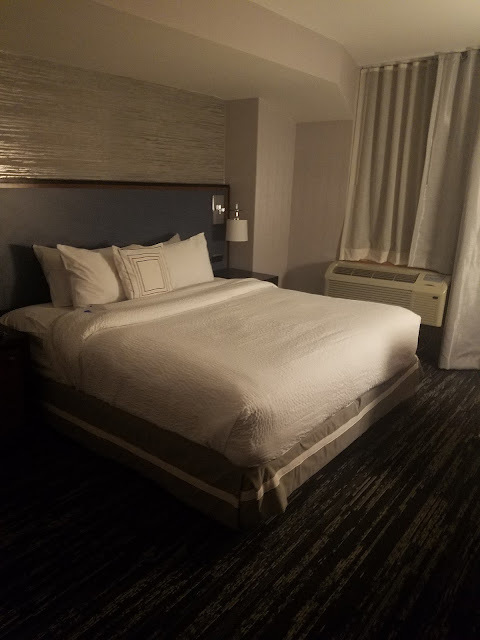 Our hotel room at the Fairfield Inn and Suites was beautiful. The King bed was more than enough space for Emma and myself and after some delicious infused water from the lobby, we settled in for bed. Before venturing back out, we enjoyed a delicious Continental breakfast, courtesy of the hotel. I was amazed at how much food they offered, and it was so yummy! 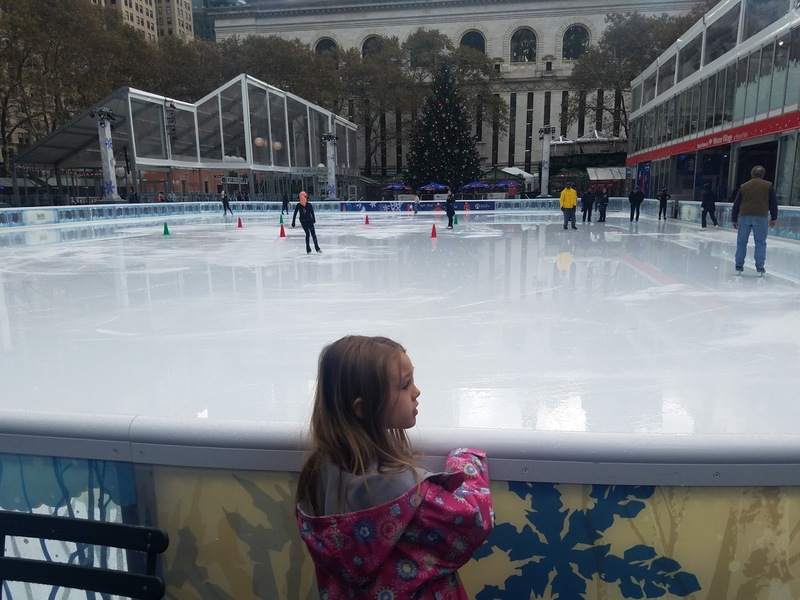 On our way to Grand Central to catch another train back to the boys, we stopped at Bryant park and checked out the ice skating and little shops. We wanted to go in the library but it wasn't open yet so we decided to catch the earlier train. Two hours later we were back with the boys and visiting family in Connecticut. It was such a crazy, emotional night away but it is absolutely something I look back lovingly at. 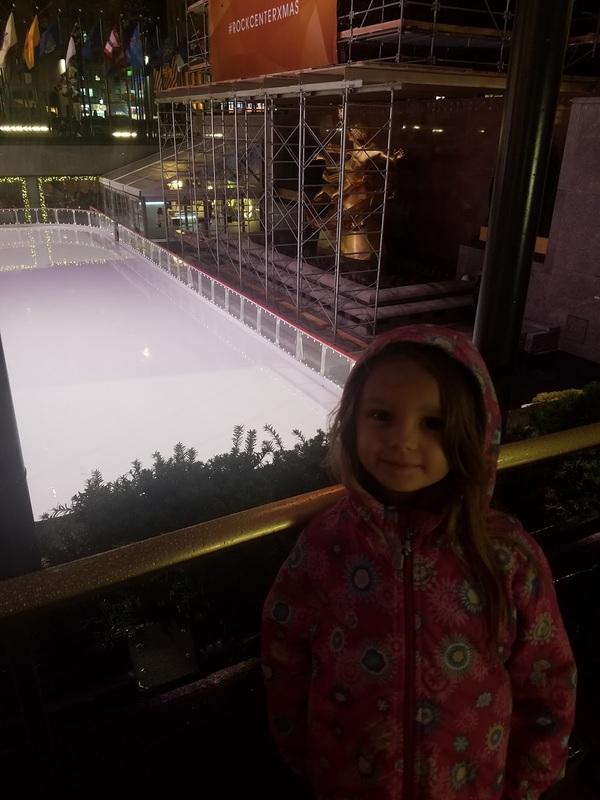 I love how much joy it brought my girl. I was provided this toy in exchange for a review, however all thoughts and opinions are my own. 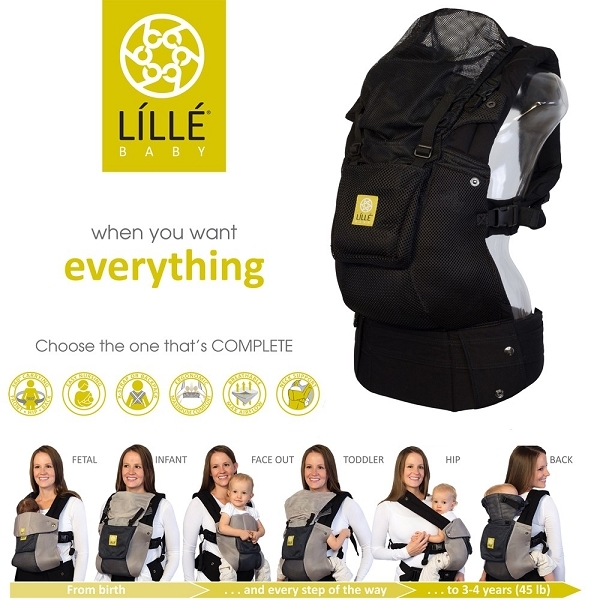 Shopping for both of my kids has been ridiculously easy this year. They love all the toys that are out and I think so many of them are actually adorable and fun! Tyler has been a huge fan of Paw Patrol over the past year and it's one of those shows that I am actually okay with him loving! The characters are super cute and the show is literally based around being helpful and good to others! It was no surprise to me that much of Tyler's holiday wishlist revolves around Paw Patrol: more characters, the Ride on Quad, the Air Patroller Plane, and the Paw Patrol My Size Lookout Tower. But let's be honest, watching our own kids play with the toys is so much better! 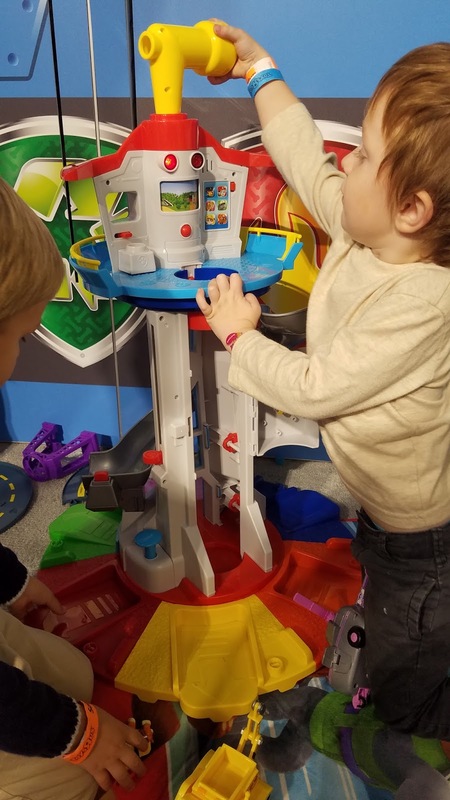 I love that the My Size Lookout Tower is large enough for Tyler to play with his friends. The end of the slide is the coolest- it shoots the pups in the air and into their vehicle! The rortating base allows each pup to jump into their own vehicle. 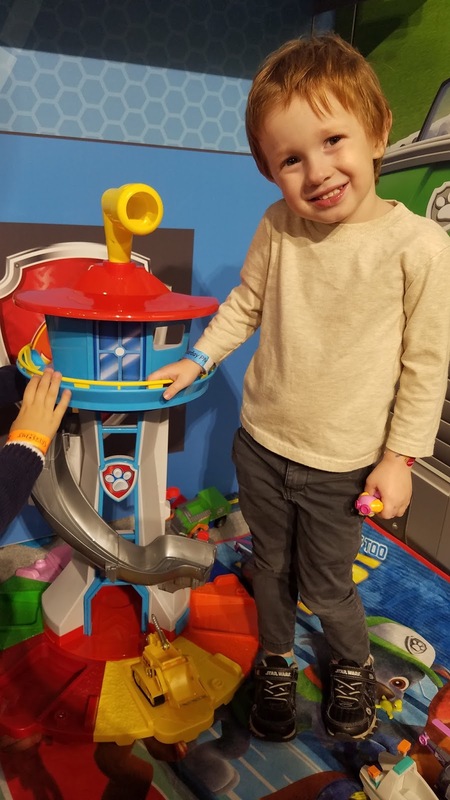 He's always all smiles when it comes to Paw Patrol! The working elevator moves the pups up and down if needed. 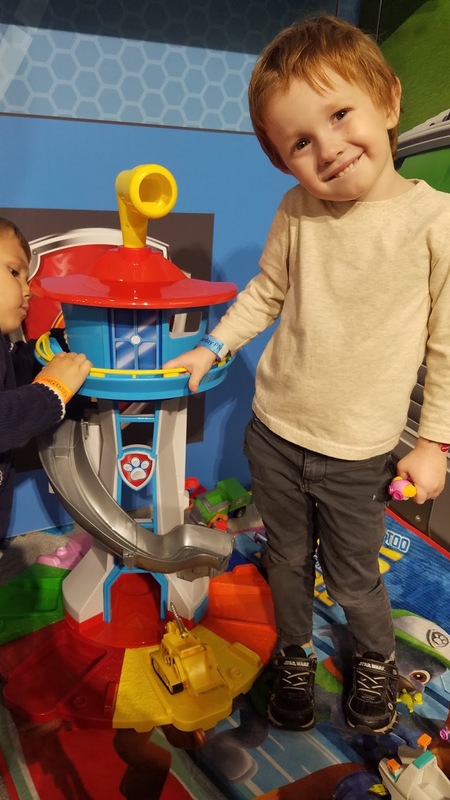 The My Size Lookout Tower also has lots of different buttons that activate things like lights and sounds, or the pups' signature catch phrases! 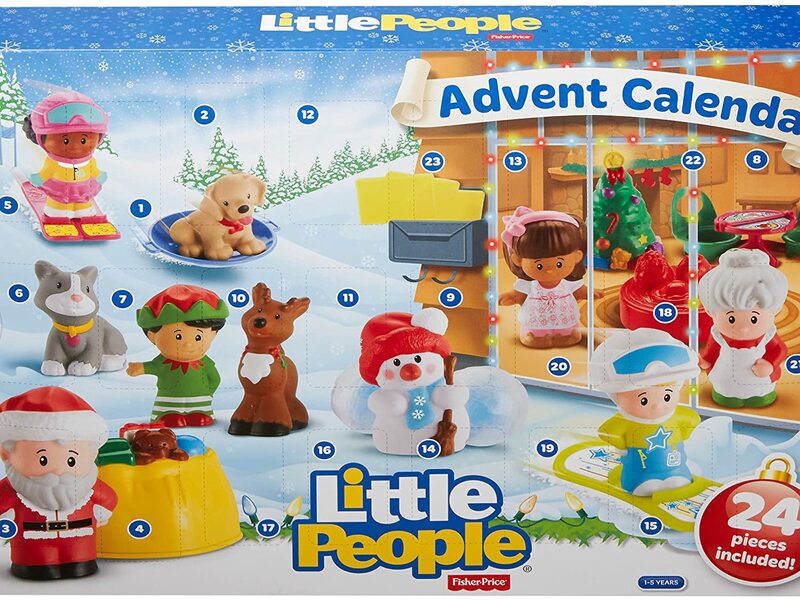 It's such a great toy and we are hoping Santa leaves it under our tree! 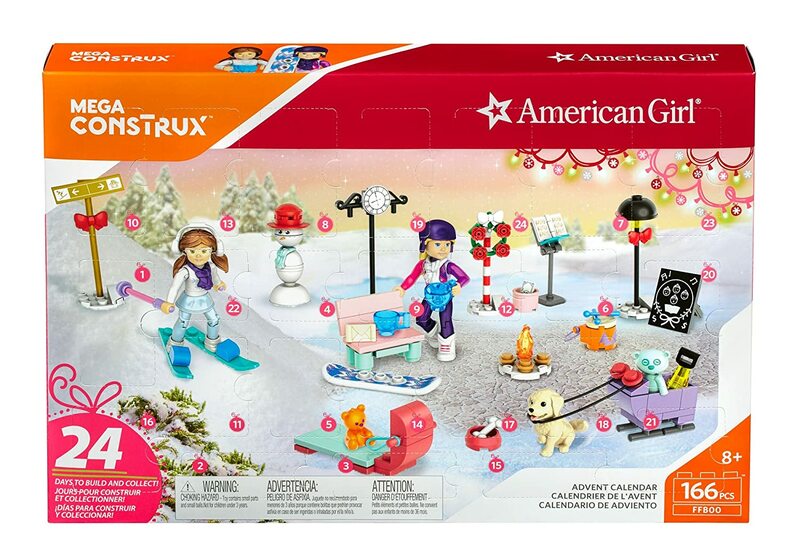 Otherwise, you can purchase it at Amazon, Target, Toys R Us, or Walmart, as well as lots of other major stores! Let me know who you'll be picking it up for!